We look forward to your stop at Four Seasons on your next snowmobile ride! Full service bar with cozy fireplace right on Lake Namakagon! 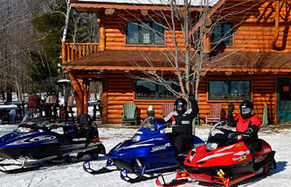 Winter Cabin Rentals on Northern Wisconsin’s Best Snowmobile Trails! 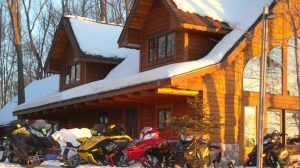 We invite you to plan your next Wisconsin snowmobile vacation in one of our cozy vacation homes, cabins or lodge rooms. Our comfortable vacation homes include beautiful fireplaces and plenty of trailer parking. 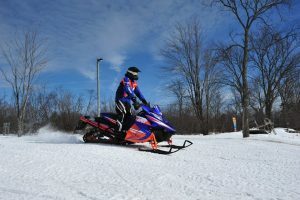 Park your snowmobile trailer and ride right from the front door of your rental and directly onto the popular snowmobile trails winding across Lake Namakagon and interconnecting with the Bayfield County snowmobile trail system! 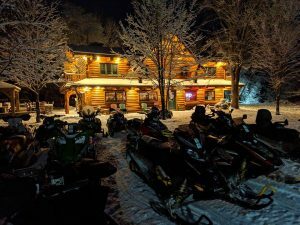 Lodging on Lake Namakagon Snowmobile Trails! Located directly above the main lodge, our resort offers 3 spacious guest rooms for snowmobilers. 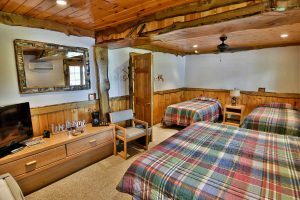 All of the lodge rooms feature their own private bath, mini-refrigerator, microwave, coffee-pot, TV, air conditioning and free wireless internet. In addition to the private bath in each room, there is also an extra bathroom next to the common sitting area which has couches, a television set with Cable TV, microwave and full size refrigerator/freezer. Sled right to the Main Lodge! Ride Right from Your Cabin or Lodge Room! Built in a true Northwood’s spirit with log, large stone fireplace and log accents, the Main Lodge at Four Seasons Resort is a wonderful place to gather and relax in comfort. The Lodge has a smoke-free full bar serving your favorite cocktail including our famous Bloody Mary’s, Margarita Mondays, Wine Wednesdays and Friday martini nights! Warm up around the beautiful fireplace, relax at the bar or play games in the game room. 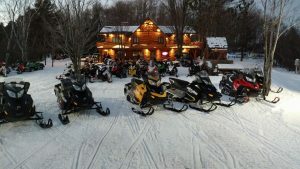 Our location in the Northwoods of Wisconsin is an excellent winter vacation destination during the snowmobile season! Get the Latest Snowmobile Trail Details Here! Remember that snowmobile trail conditions can change quickly so please LIKE US on FACEBOOK and check FOUR SEASONS RESORT’S FACEBOOK PAGE for snowmobile trail reports, photos and resort happenings!